Heavy rain this morning heralds in this post of the passing of yet another Goshin-Do Karate-Do Yudansha (black belt). Sensei Jeff Tyne passed away on April 11th, 2015. 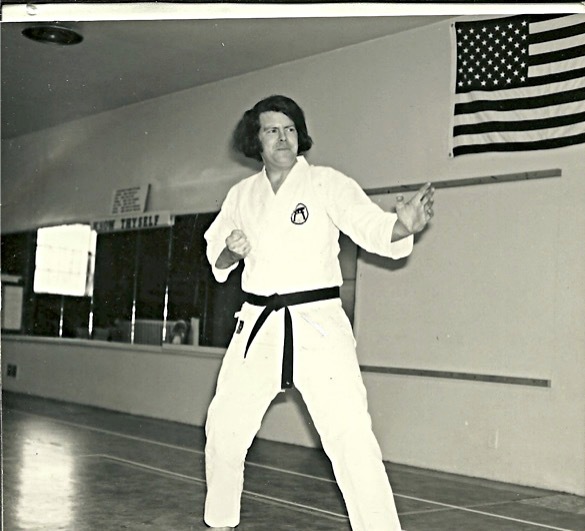 During the camelot years of the Academy Of Goshin-Do Karate, Sensei Tyne, a Ni-Dan operated one of the four dojo teaching Goshin-Do Karate-Do under the leadership of Shihan Thomas DeFelice. I first learned of Sensei’s passing shortly after posting the memorial of Shihan Paul Recchia’s passing on April 10th 2003. I waited a week before posting news of Sensei Tyne’s passing out of respect for both he and Shihan Recchia. So now, each year I have another memorial for a fallen Goshin-Do comrade to add. As the rain pelts the window to my writing room, I look out at the cherry blossom tree in the yard. How strange is my duty? I take great pride in the fact that I am one of the few in Sensei DeFelice’s dojo to have known each and every one his his black belts. Now decades later, my duty is to simply remember them. And so, here is the first hatsu bon memorial poem for Sensei Tyne, one of the two examiners who in 1976, when I was age fifteen, failed me on my first attempt to earn fifth-kyu, green belt in the adult division, but in doing so helped to forge my unrelenting spirit. Thank-you for doing so Sensei. I trained under sensei Tyne at the Lodi Dojo until I had a near fatal motorcycle accident on September 18, 1976 which ended my ambitiomn to excel in Karate. I had the greatest respect and admiration for Sensei Tyne and my fond memories of my time training with him will never fade from my thoughts. Hello & thank-you for your comment & sharing your memories of Sensei Tyne. I started training in 1971 in the Junior Division under Sensei Nick D’Antuono. However, I knew Sensei Tyne via dojo get-togethers, such as testing, promotion and Shia (inter-dojo tournaments). Sensei Tyne & Sensei Kingston tested (and failed) for my green> Sometime around 1976 I passed and was moved to the adult division at age 15. I then studied directly under Sensei DeFelice and came to know all of the black belts.